Show your child the world of fun and uncommon produce with this brief introduction to counting! 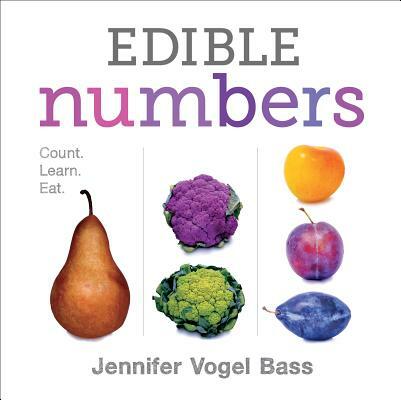 Edible Numbers is filled with pages of high-quality food photographs that can help your child understand counting - and that their fruits and veggies can come in all shapes, sizes and colors. Now available in board book! Juicy apples! Plump, ripe pears! Twisted mushrooms! Counting your way through the farmer's market has never been so much fun. Discover a world filled with exciting fruits and vegetables in this bright, bold follow-up to Edible Colors. This simple concept counting book will leave your mouth watering as you count from one to twelve with a kaleidoscope of tasty produce. Readers will learn about counting, variety, and color through the detailed, crisp photographs of homegrown and farmer's market fruits and vegetables! Jennifer Vogel Bass grew up in rural Vermont. She has a BA in anthropology from Tufts University and an MA from the Yale School of Forestry and Environmental Studies, where she focused on environmental communications and sustainable agriculture. She is the author and photographer of Edible Colors. Over the course of three years, she photographed every variation of a fruit or a vegetable she could find. Currently, Jennifer lives with her family in leafy Maplewood, New Jersey.